This month’s Barsati speaker is Arti Jaiman, the Station Director of Gurgaon Ki Awaaz Samudayik Radio, a community radio station in Gurgaon that has been on air since 2009. Set up by the NGO, The Restoring Force, Gurgaon Ki Awaaz is a National Award-winning station that has a listenership of over 5 lakh listeners who tune into its unique programming blend of folk music, community-based programs on health, education, livelihood and governance. Gurgaon Ki Awaaz is the only civil society community radio station in the National Capital Region of India, broadcasting continuously 22 hours a day since 2009. The station is a platform for the diverse voices and communities of Gurgaon, with a special emphasis on voices left out of the mainstream media narrative. A journalist by training, Arti has led the process of setting up the first civil society-run community radio station in the National Capital Region with a clear focus on creating a vibrant media space where marginalized community groups such as local villagers and migrant workers can tell their own stories, in their own voices. Over a career spanning 25 years, Arti has worked for The Economic Times, co-authored books for SCERT, Delhi, and Indian Council for Child Welfare, Delhi, and has written for The Hindu, Tehelka and The Hindustan Times. 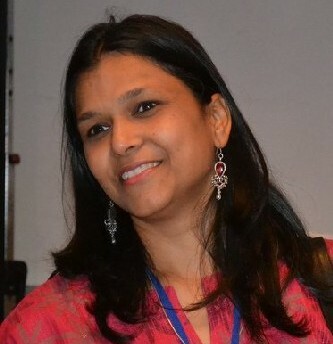 She co-founded www.pitara.com, India’s first children’s website in 1998. Arti completed her Bachelors in English Literature from Delhi University, a PG Diploma in Journalism from Indian Institute of Mass Communication, New Delhi; and a Masters in Journalism from Indiana University, Bloomington, USA.